Or at least that was the plan. 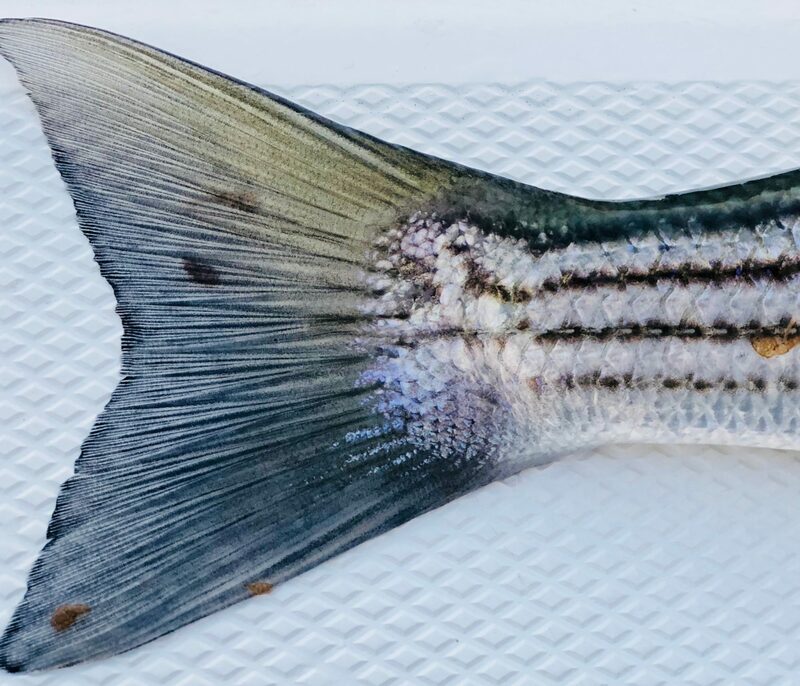 It was late May, and the first reports of migrating striped bass in Plymouth Bay were making their way around the local fishing community. Now to be clear, I was born and raised in Plymouth, MA. My family has always kept a boat in the harbor and I grew up spending every summer out on the water. I spent a good portion of that time being a rather unsuccessful fisherman too. I never once caught a keeper, and aside from a handful of bluefish and the occasional string of mackerel, my fishing trips almost always left me empty handed. But with Billy’s invitation, I knew all of that was about to change. Jon always told me that Billy was an avid fisherman and I was excited by the prospect of finally being able to learn about fishing the waters in the place I call home. With that in mind, I felt like a kid on Christmas Eve anxiously awaiting the coming morning. I set my alarm for the early wake up and fell asleep in my South Boston apartment. The default iPhone ringtone trumpeted loudly on my nightstand. Blurry eyed and groggy, I answered my phone. Startled from the abrupt wakeup, I glanced at my alarm clock. 4:45am. Within 5 minutes I was dressed and in my car headed to Plymouth. After setting a new land speed record on route 3 south, I finally arrived to find the Mal de Mer waiting at the dock, fully armed with rods, coolers, and Styrofoam Dunkin Donuts cups. “No worries man, let’s go get some fish!” Billy interjected. The Yamaha 150 hummed in the background as we exited the harbor and made our way to the “1 can” off of Gurnet Point. As the first hint of sunlight peeked over the horizon, turning the sky into a watercolor fusion of pink, red, and orange hues, the first string of mackerel was brought aboard. It didn’t take long before the livewell was full, so we sped off toward the backside of Clark’s Island in search of bigger game. “We’ve got some big marks here” Billy said, pointing to the fish finder. He killed the engine and began to set up the rods. Meanwhile I was absorbing everything: the way the rods were rigged, how the mackerel were hooked, and how to interpret the mess of amorphous blobs and sharp crescents on the fish finder. The next thing I knew, the baitrunner drag in my hand screamed, and the rod tip slammed down. “Let him run with it for a few seconds before setting the hook” Billy shouted. After waiting what felt like an eternity, I gave the reel a quarter turn and the hook engaged. I can’t even remember how long the fight lasted. Fishing is funny like that, you lose all awareness of the passage of time during the heat of battle. With my adrenaline still pumping, we landed the fish and held it up to the measuring tape. “31 inches, that’s a good fish for May!” said the Captain. High fives were exchanged and the next mackerel was placed on the line and sent into the abyss. The rest of that morning brought more stripers and more opportunities to learn the art of fishing. Once we had finally caught our limit for the day, we headed back to the dock. “Same time next week?” Billy said half jokingly. That night I had grilled striped bass for dinner. I love all things seafood, but this meal was particularly special. Not only was it my first time eating striped bass, but it was my striped bass. My first keeper–caught in my own backyard. That weekend in late May precipitated what became a regular Saturday morning tradition for the rest of the summer. Early morning wakeups, coolers full of ice, beer, beef jerky, and Cumberland Farms sandwiches. Fumes of outboard engine exhaust rising to greet amber sunrises burning like wildfire above the rippled water. The sound of seagulls and channel marker bells chiming in the background of friends laughing and reel drags buzzing. That’s the beauty of fishing. No matter what you’ve got going on in life whether it’s stress at work or at home, or preoccupied thoughts about how the Patriots or Red Sox are going to play, all of that disappears the moment a fish strikes. It’s no longer you and your problems, it’s just you and the fish. And for those thrilling moments of give and take with the fish on the line, you get the opportunity to escape from it all. Even on the days when the fish aren’t biting and you tie back up to the dock empty handed, you’ve still spent time with good friends, having good laughs and making good memories. That’s not a bad way to spend a summer day. I recently came across some of my grandfather’s old fishing gear. I never really got to know my grandfather. He died when I was young and the only memories I have of him are preserved within the sepia toned pictures in photo albums and dusty VHS tapes in a few family home videos. But I do know that he was a man who loved the outdoors. Rummaging through his musty wicker creels, I found a rusty filet knife and a canvas pouch containing a few of his own hand tied freshwater flies. I can’t quite describe the feeling, but as I picked up one of these flies knowing that he once held it in his own hands, I pictured him standing by a babbling brook somewhere, fly line dancing in the air arced in an open loop. I felt an inexplicable connection to the grandfather I never knew. Not wanting to see his vintage equipment further deteriorate, I decided to bring some new life to his old filet knife with steel wool and a honing stone. I keep his canvas fly pouch in my sling bag for good luck. In some ways I think fishing has become a way for me to honor his memory. But more importantly it has become a way for me to discover more about myself. This past summer on the water will always stand out in my mind as being special. I’ve never laughed so hard, slept so little, or felt so complete. This is why I love fishing and this is how I got hooked onto a hobby I’ll continue to practice and refine for the rest of my life. And who knows, maybe one day many years from now, my future grandchild, or great grandchild, will find my own fishing gear, rusted and lovingly worn with the scars of fishing trips past, and maybe it will inspire a lifelong passion for them as well.